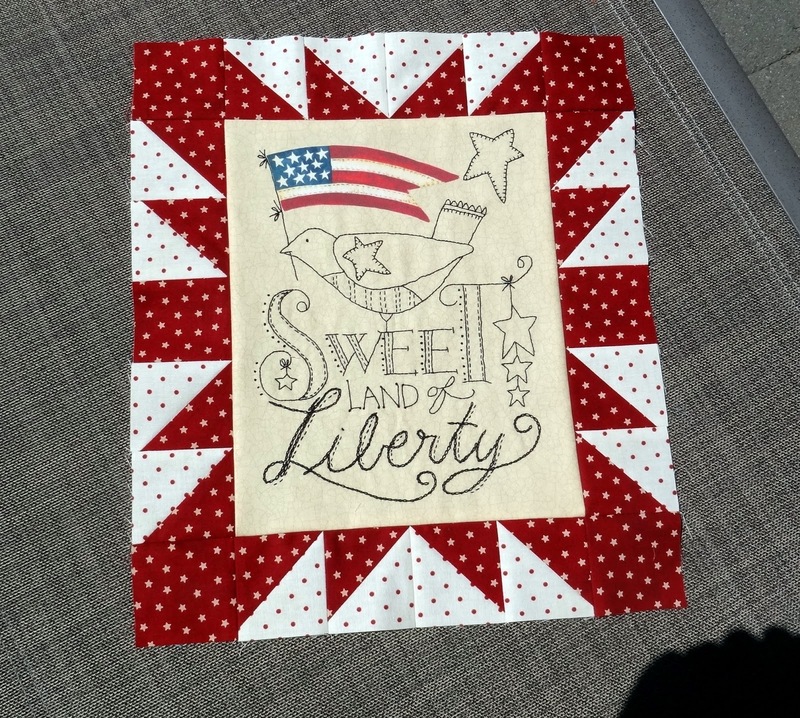 Squash House Quilts: When We Sleep, Mom Sews! Hi Everyone! Sasha and Gracie May here. 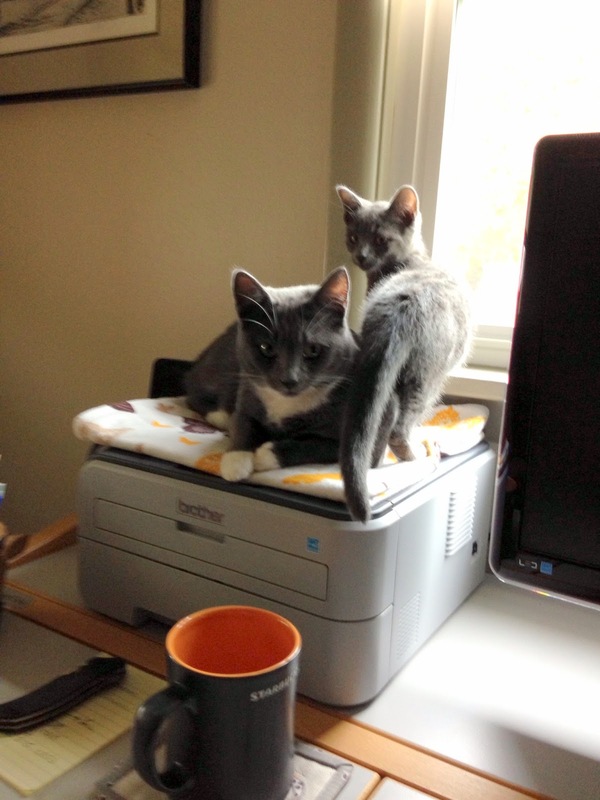 We thought we'd snooze together on top of Dad's printer and give mom a chance to sew without us stealing pins and knocking over scissors. We think it's a lot of fun, but Mom gets after us all the time and spoils our fun! 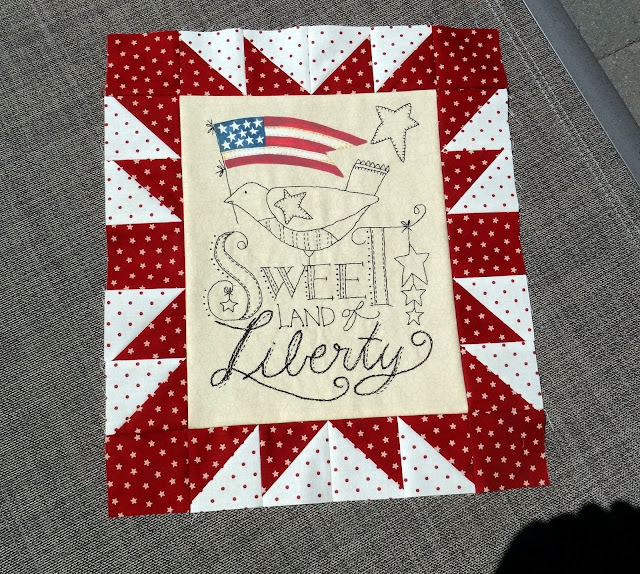 She had a very productive couple of hours and finished two of her Kathy Schmitz BOM's. We actually don't know what BOM means. We thought it might stand for Barrel of Meow's but Mom says that isn't quite right. There seem to be lots of birds in these blocks. Funny thing, though, they don't make any noise or flap their wings, they just sit there and look pretty! We heard somewhere that they're good eating. Mom says this is the June block. 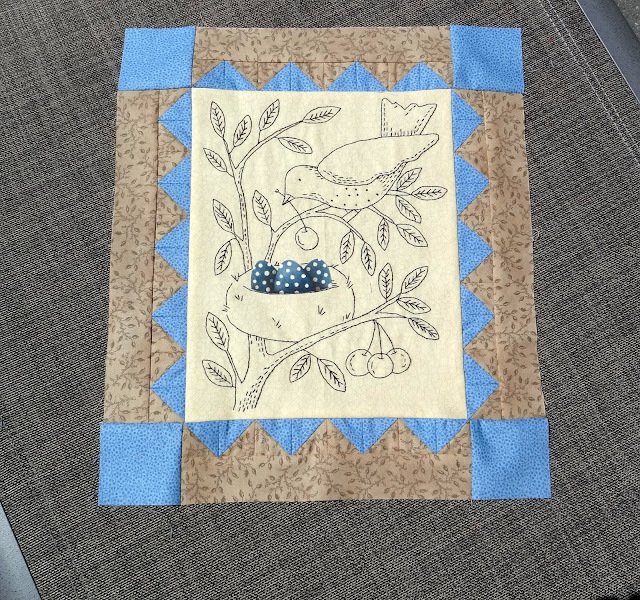 This is the July block. Very patriotic, and I swear neither of us has ever seen a bird carry a flag! How cool is that! We wonder if birds, er, flags taste any good? 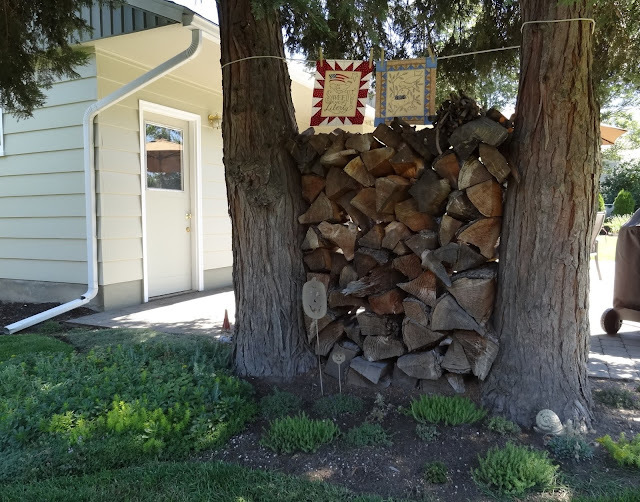 Mom hung both blocks above Dad's fairy garden. I (Sasha) love to explore the fairy garden. Every so often something new pops up like that cute little elf in the background who doesn't speak or move and that funny little snail character that I tried to eat once but didn't like the taste at all! The two weird faces in the middle scare me right now. You're probably getting tired of seeing us so much, but we just had to show you what happened when Gracie woke up from her nap first while Mom was sewing! I see a bigger printer is in order. They barely fit now. What happens as Gracie May grows???? So glad you girls are getting along so well. Your mom is very happy about that! Poor Sasha as trying to sleep I guess Gracie decided nap time was over :-) How Cute ! Awww!! They are getting along great...like momma and baby..so sweet! You girls are just too cute and growing way too fast! Gracie May...I think your childish ways are going to get you in big trouble with Sasha. I suggest you tread lightly. And tell her that I needed this kind of post today! Looks like the girls are getting along just fine now. How cute are they! Thanks for sharing! Your blocks are beautiful. The HST around the stitching are just perfect, it would take me ages to get them all the same size. I'm glad to see your girls are friends now! More gorgeous blocks. How nice the girls did a guest post. Did you ever think they'd be so affectionate towards each other? Glad to know I'm not the only one who has kitty control issues in the sewing room. They are so cute together and Gracie appears to be crusin for a brusin from Sasha. Glad they are finally getting alone and so comfortable with each other. Hugs! Aww!!! So sweet!!! Love your bom's too!!!! Really great blocks, and such happy kitties! Your "barrel of meow's" are cute but my favorite is the video of your babies. How darn cute are they!!! These are the two that I finished first too. I don't have the borders on them but they are ready for that. I'm doing the squirrel next. Adorable kitties! I don't know how you get anything done for watching them! Oh, I lover your kitties. They make a nice pair. Wonderful work and so lovely cats.